Solo parenting is all about trade-offs. You give up your carefree ways for the love of little tyrants. You trade that cute young woman in the mirror for that tired, cranky person who is brushing her teeth while yelling at her children. You give up sleep for feedings, croup, fevers, monsters under beds, school runs, water-polo tournaments, scholastic quiz bowl-a-thons, and camping trips. It’s all worth it, we tell ourselves, looking over our shoulders at times past. After all, it gets better as they get older, right? At least they’re sleeping through the night. Look at those little angels tucked into bed by 9:00 p.m. and giving you time to hang out with yourself for at least an hour. Finally, a little breather in that vigilant schedule you have kept to make sure no one is hungry, dirty, or tired. You’ve always had solutions close at hand. Sandwiches in the tub, anyone? Lunches packed while dinner dishes are being cleared? Check. You are feeling like you can handle this. Third grade is not so bad. Little League is a piece of cake. You’ve even finished reading a book or two. And then, just when you thought it was safe to relax a bit, you are hit by two forces spinning at you at the same time: hormones and middle or high school schedules. Hormones. Studies have long shown that at about age 10, those kids who woke you up at the crack of dawn—even on weekends—will begin that long journey into adolescent rhythms. The irony is that, at the same time, their school schedules begin to fill up with all sorts of other activities. And their bodies fill with emotions. Those simple solutions of a cup of warm milk or a bedtime snuggle just won’t cut it anymore. Schedules. Though people keep complaining about it, most middle and high schools start the school day earlier than many elementary schools do, and kids who have orchestra or band or play a sport or do drama often have to arrive an hour before school starts and/or stay several hours after school dismissal. Studies blasted over the Internet have found that tweens and teens who don’t get enough sleep will suffer from depression as well as poor grades. This can be one of the most stressful worries for a Solo Mom. Is your kid at risk? Is it your fault? 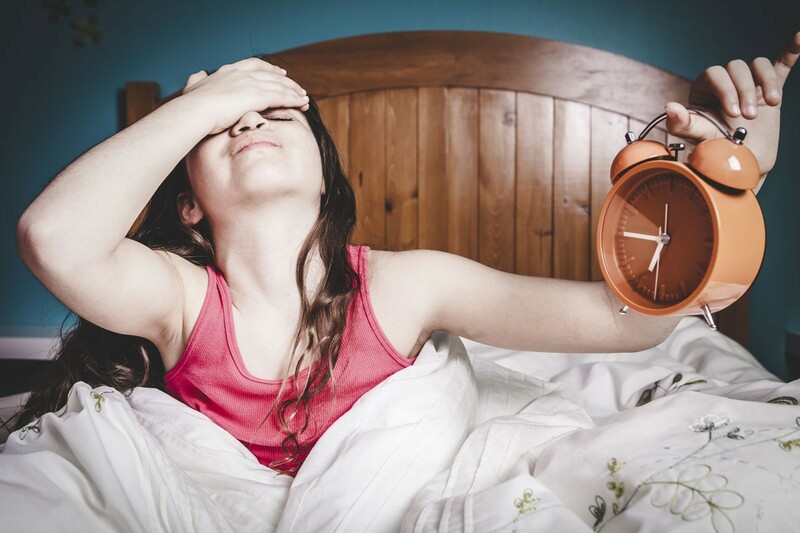 Are you a terrible role model because you hate mornings, too? Of course not. Actually, if you look at the studies, children who are already at risk may become more at risk, which is another issue altogether. For all the scary stories on the web, one of the most important things to remember is that these hormonal stresses are normal—unpleasant for everyone involved, but still normal. You, as a Solo Mom, have to try to keep calm and keep it under control. Is there a T-shirt for that? Do the best you can to make sure lights-out really means lights-out. It won’t always work (electronics today being what they are), but try to create a chat/text moratorium after a certain hour. That should include you. Try to slow the pace and create a bit of quiet and calm. Prep. Get yourself as organized as you can for the next day. Clothing choices, showers, etc. It’s a new schedule, but it is just as important to get on a schedule of your own for your kids at this age as it once was for their feedings when they were infants. Have a checklist ready for the next day with your kid. Homework? Anything you need to sign? Any upcoming donations or baked goods needed? Does the schedule for next-day activities need any tweaking? It’s good to coordinate and consult with your teen. Nothing is worse than suddenly discovering it’s the last day for permission slips and you were never informed until you are rushing out of the house. Calm. Although you can’t sing a lullaby or read Goodnight Moon to your 13-year-old, sometimes a little yoga and talk about mindful breathing help encourage relaxation. You can teach your kids to put themselves to sleep. It’s not foolproof with all those emotions raging, but it’s worth a shot. Set your alarm for 10 minutes before they have to get up. Give yourself a break. You’re going to need those extra minutes to prepare for battle. Maybe even include a quick stretch and some jumping jacks so you are primed for action. Breakfast. Yes, it is the most important meal of the day, but there may not be time to get them upright and sitting down at a table. So pack an extra on-your-way-to-school protein snack to go with a smoothie or something else that can be eaten quickly. Embrace being the snooze alarm. Do not panic if the first time you try to wake them they go back to sleep . . . or the second. But just like a snooze alarm, you should get a little bit louder and more persistent each time. Wake them up 10 minutes before they have to get up, then five, and then when they have to. Once they are on to you or have slept on their phone, put in that last urgent “now we’re really late” buzzer. Finally, if the carpool will be there in five minutes and your teens are still in bed, go for the nuclear option: enter their rooms and start to pack their backpacks. There is nothing like messing with your teenagers’ stuff to get them out of bed fast. Remember, this is the ipecac solution, so save this for the “last tardy you can afford this semester” day. Think of it this way: they woke you up for years; now it’s your turn. Do you have a specific parenting challenge that you’d rather not share with your mom friends? Sister Chat is a great place to ask the hard or awkward questions anonymously.